JAKARTA, Indonesia (CNS) — Christian leaders called for unity following a spate of suicide bombings that targeted three churches, an apartment building and the police headquarters in Indonesia’s second city, the deadliest attacks in more than a decade. Ucanews.com reported that early May 14, a family of five, including three children, carried out a suicide bombing on two motorcycles at police headquarters in East Java’s provincial capital, Surabaya, police said. At least one fatality was confirmed, but initial reports said at least seven people were dead, including four of the attackers, and that 10 people were injured, including four policemen. An 8-year-old girl, who was reportedly with the family, survived the blast and was being treated in a hospital, said an East Java police spokesman. The attack followed a series of bombings a day earlier in the city that killed at least 17 people, reported ucanews.com. Three suicide blasts were committed by one family — a husband, wife and four children — against three churches in the town. The first bombing was carried out by the couple’s sons, 18 and 16, in the parking lot of the Santa Maria Catholic Church; the second was by the wife, and their two daughters, 12 and 9, at the Diponegoro Indonesian Christian Church. 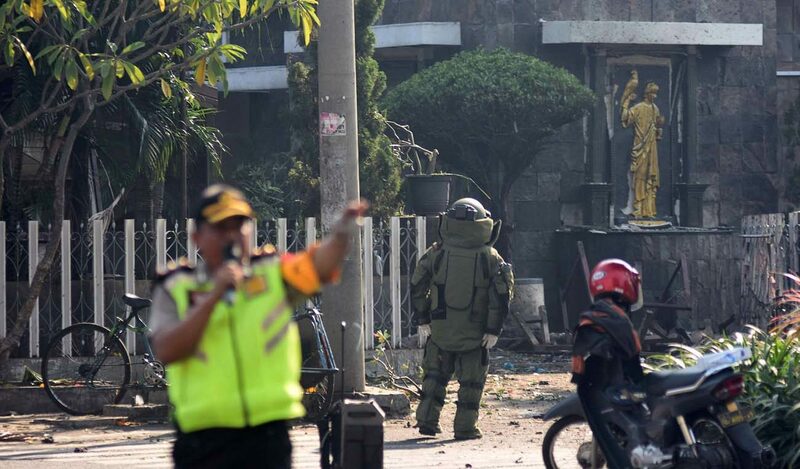 The third was detonated outside the Surabaya Central Pentecost Church. One of the casualties at Santa Maria Church was Aloysius Bayu Rendra Wardhana, who was killed trying to prevent the suicide bombers from entering the church compound. Father Alexius Kurdo Irianto, parish priest, praised Wardhana’s bravery and sacrifice. “If he had not stopped the bombers, there would have been more victims (inside the church),” he said. Another blast also occurred at a low-cost apartment, killing three people. Gen. Tito Karnavian, national police chief, named two groups inspired by Islamic State that were likely responsible for the attacks. The leaders of both groups are currently in prison. “Because their leaders are detained, their groups could be retaliating,” said Karnavian. He also said the attacks could also be in retaliation to the arrest of two suspected terrorists and the deaths of four others May 4 in Bogor. Father Agustinus Ulahayanan, executive secretary of the Indonesian bishops’ Commission for Ecumenical and Interreligious Affairs, denounced the bombings and called on Catholics and other Christians to unite and be vigilant. “We must not be afraid. We must tighten security,” he said.